Modified 150 Ton H Frame Roll Bed Press – Phoenix Hydraulic Presses, IncModified 150 Ton H Frame Roll Bed Press with 64″ Daylight, Electronic Winch to raise and lower the head plate with cylinder. 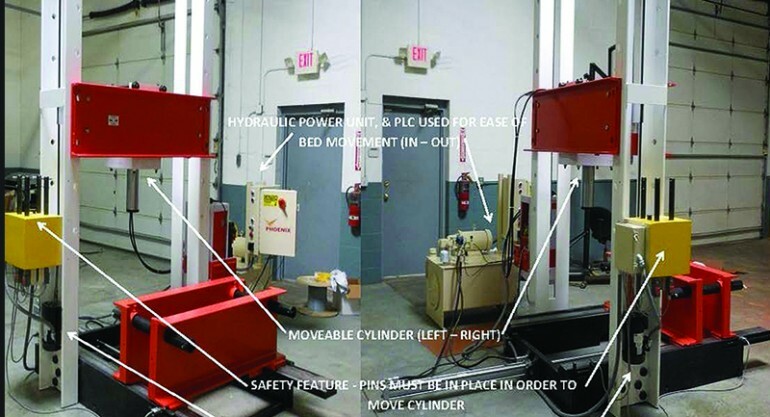 Separate Power Unit with Cylinder, PLC Controlled, to move Bed In/Out, capable of handling 7,500 lbs. Press is surrounded by Welded Wire Mesh Guards Floor Standing with Safety Interlocks. Press was built for a Major Manufacturer of Mining Equipment.